I have a Samsung Smart UHD LED TV UA75JU6400. 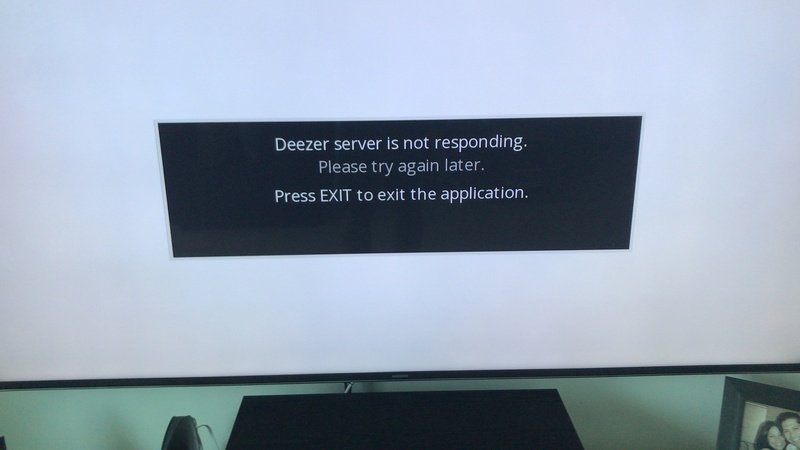 I downloaded the Deezer app through Samsung Smart Hub and it comes up with "Deezer server is not responding. Please try again later. Press exit to exit the application"
I downloaded it yesterday and tried again today but no dice. Internet connection is working fine. It doesn't even go to a login page. This is the first image that comes up when I click on the Deezer app. Is there anything additional that I should be doing? Would appreciate some help. Hi guys, I believe this is happening because the Free accounts do not work on tvs... Are your accounts Gratuit? Wether or not I have a paid account or free account is irrelevant. I can't even go to a log in page. Even if I had a paid account I still can't get in anyway because the login page doesn't even show. I don't have access to anything when I launch the app. Like I mentioned in my initial message, the error message comes up as soon as I click on the app to launch it. I see, so it's happening before you are logging in. I'm so sorry about that! Some user reported the same issue and our devs are working on it. Hopefully they will be able to get it fixed soon!